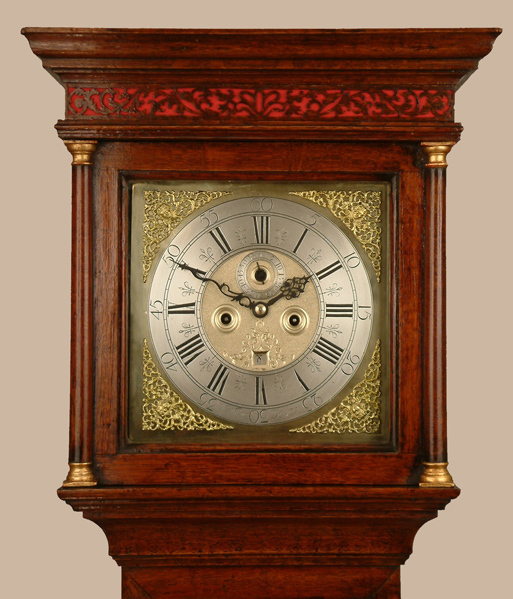 William Wilkins of Devizes Longcase Oak Circa 1725 - Height 82.7in. This Longcase Oak Archive's Maker - Wm. ( William ) Wilkins of Devizes. Recorded born circa 1693, married in about 1715, Died 1776. A good quality, well proportioned, long door, plain oak case with flat top hood and pillars integral with hood door.Side windows to hood.Red "silk" backed fret. 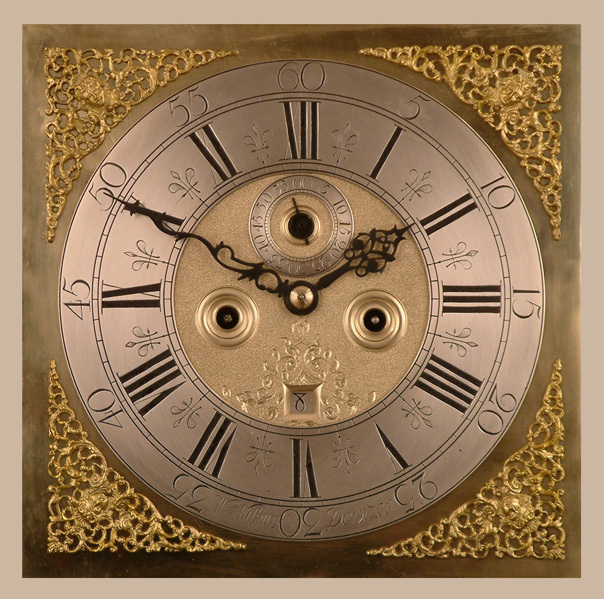 12" square brass dial with finely matted centre, silvered chapter ring, subsidiary seconds dial, square date box with engraving around, and blued cut steel hands.Ringed winding holes. "Indian head" spandrels. Well executed, good quality, Knopped, ringed and finned 4 pillar, 8 day movement with hourly ( inside countwheel ) striking on a single bell. Wm. ( William ) Wilkins of Devizes. Recorded born circa 1693, married in about 1715, Died 1776. 82.7" ( 210 cms. ).